The piece you see above is my submission to this week's Diva's Challenge #221. The Diva herself had organized a fun run to raise money and awareness for a program called Beads of Courage. In this program, kids who suffer from chronic illness receive a bead every time he/she completes a treatment or for testing. Please check out the main website here. There are so many ways for people to get involved. There are fundraisers, you can donate beads, you can participate in the "Carry A Bead" program. When I saw the challenge, I knew I wanted to create a necklace and I went through my list of patterns and chose Blooming Butter (the center piece), Jujubeedze (the first set of beads), Cruffles, and Jetties. I decided to keep the beads black/white with purple shadows. I'm really thankful to the Diva for letting us know about this great program! Have a great Tuesday! Love your ZIA so much!! What a creative way to do Beads of Courage - just lovely!! What a terrific Challenge response. It is so beautiful, and I love the patterns you used in your necklace. How beautiful! I must say I love the green eyes the best, but your use of Blooming Butter for the necklace centerpiece was truly inspired! This reminds me of a Modigliani portrait. Very nice. Blooming butter in the necklace is a great idea! Lovely beads decorating a beautiful portrait! 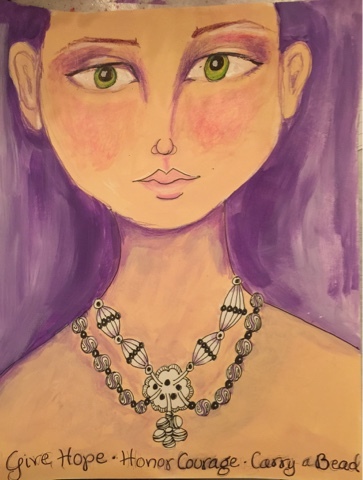 A lovely necklace and a lovely face! Thank you for commenting on my blog. What a fine portrait! I like it! C'est un beau collier que j'aimerais bien porter ! It is the beautiful necklace which I would like to wear !